Having information on current production status is a key success factor in automotive production. The quality of the decision making is linked to the data quality and the data preparation. In control system plants zenon guarantees data collection and zenon Analyer supports the data analysis by giving conclusive reports. This enables both process data as well as data from external sources to be processed. 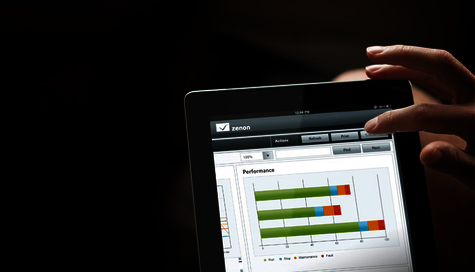 The zenon Analyzer collects data from various sources and displays them in a high quality graph. This can be used, for example, to easily compare historical and current values. Statistical analysis or the calculation of production figures can be obtained per mouse click. The zenon Software Platform offers a multitude of prepared reports which are immediately usable. These can be tailored to company specific requirements. The practical use of these reports in automobile production is diverse and ranges from evaluations of alarm statistics, cycle time analysis and quality documentation to analysis of production figures.